Installing GO Keyboard APK version 3.00 is the best option for you who want to get easier in typing in the slippery screen. We know that the size of thumb of someone and the other else are different each other. It makes you are harder in achieving the accurate typing on your screen of the phone. There are no other solutions besides changing the typing mode into the classic one. However it will take a very long time for you to type many words. As a solution, you can install GO Keyboard. It offers you easy typing without miss type as before. The presence of this keyboard will give the new look and appearance for your phone every time you are doing the type. It will appear automatically on the window of your chat box, SMS and many more. You do not need to reopen the app every time you turn off your phone. 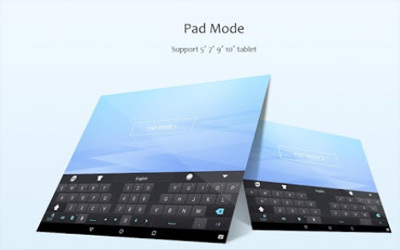 It will run automatically as well as the original keyboard from the android device. It is also have so many features that are interesting. You can see the presence of fast typing option. Now you does not need to type slowly in QWERTY mode. Just type everything faster and more correctly. Some of the features are also available in the Coolest Friend-Lacking mode. It wills give you opportunities to personalize the keyboard based on your needs. So, you can use the element like emoji, fonts, sticker and many more as you want. If you are too bored with the presence of your classic keyboard, there are more than 10000 colorful themes for making the keyboard beautiful. More than 100 fonts are also available to be chosen. In this new version you will get new emoji and emoticon that all are interesting. The use of GO Keyboard for android will make your conversation alive and more comfortable in the eye. Support for the BÉPO keyboard Layout. Optimize French and German input experience.